:: How do we perceive sound? :: CAREERS: Is the sky still blue in Emerald City? :: Sherman Alexie: "It's all good"
:: World health care: "Many countries have their priorities wrong"
Cover: A young fan gets his autograph from quarterback Jason Gesser. Read story. Photo by Shelly Hanks. Ah, for the safety and comfort of computer modeling in a cozy office. 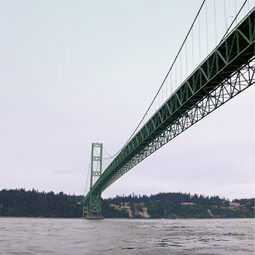 Instead, Thanos Papanicolaou, assistant professor in the Department of Civil and Environmental Engineering at Washington State University, found himself in a small boat in the churning waters of the Tacoma Narrows during a "peak tidal event'' taking water velocity measurements, soundings, and underwater pictures of the bottom of the channel. "I was a little nervous," he admits, recalling his guide's efforts to avoid vortices in the current. Papanicolaou and graduate student Kyle Strom have been working to determine exactly how much of a scour hole tides make around the pilings that hold up the Tacoma Narrows bridge. The work is funded by Parsons Inc., an internationally known engineering firm. The Tacoma Narrows's high winds, stiff currents, and steep banks make bridge building there a challenging engineering feat. The first Tacoma Narrows Bridge, known as "Galloping Gertie," failed in 1940, offering a textbook case on engineering failure. The current Tacoma Narrows Bridge was built in the 1950s and, while in excellent condition, is now over 50 years old. Construction of a new Tacoma Narrows Bridge, parallel to the existing bridge is set to start in 2003. Papanicolaou's work is important to assure the safety of the current bridge and for planning construction of the new bridge. Computer models had been showing that the scouring hole created by tides in the area could be as big as 120 feet deep, which made the engineers studying the problem nervous. So they were reassured when Papanicolaou's measurements showed a maximum hole of less than 10 feet during the maximum tidal event of the year. Papanicolaou's work included lowering a GPS unit to make sure that the boaters were in the correct locations for measurements. They measured water velocities and changes in the bed bathymetry, using a sonar device. No one had ever taken such measurements, so the researchers were able to determine what size of bed material provides the most stability as the tides flow over them. The work will also be used in construction of the new bridge to assure that the size of the scouring holes remains within acceptable limits. Papanicolaou and Strom are now using historical data to study the long-term cumulative effect of tidal movements on the scouring holes around the bridge.